When it comes to big third-party publishers, the Switch has been seeing a healthy amount of support from nearly all directions. Take Square Enix for example, who, over the last few months, have been unleashing its Final Fantasy series on the system or Bethesda promising the latest entries in both the DOOM and Wolfenstein brands for later this year. One company that’s been perhaps lagging behind the pack however is EA, its output so far limited to a couple of divisive FIFA releases and the indie title Fe. While we’re not likely to see their biggest IPs make the leap over any time soon, the heart-meltingly charming Unravel Two is certainly a welcome addition to the library. Ever since its announcement at last year’s E3, Unravel Two struck me as the kind of game that looked perfectly suited for the Switch largely thanks to its focus on two players working together. What better console to release the game on, than one that always has two controllers with it? 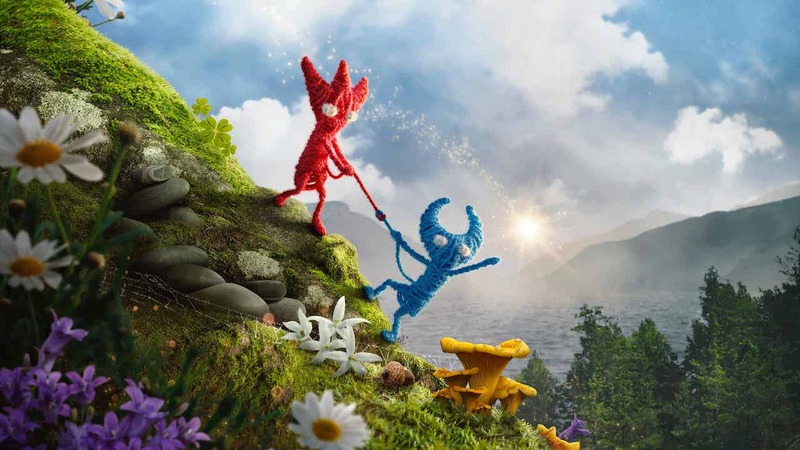 Whereas the first Unravel was purely a solitary experience, the sequel now sees you leading two anthropomorphic yarn characters literally joined together by a string of yarn. Unlike other platformers like New Super Mario Bros. U Deluxe and more recently Yoshi’s Crafted World where you have the option for a second (or in the former’s case third and fourth) player to be added into the mix (more often than not simply creating more chaos), Unravel Two requires you to play with the pair at all times. And while Unravel Two might be a 2D platformer on the surface there’s also a strong focus on problem-solving, namely getting by and around obstacles as a team. In fact, what helps really sell Unravel Two more so than so many other indie platformers out there is the fact the puzzles and even the levels themselves can be designed around the idea of co-operation. You aren’t merely two players with the same goal who can go about things their own way, you’re two players who need to work as a unit in order to complete that goal. The aforementioned connecting yarn often plays a key role in this and it surprised me how cleverly it can be used. You might find yourself maneuvering one Yarny up to a higher position so they can act as an anchor while the other either climbs up the yarn or swings from it Tarzan-style below for example. It’s not just about getting to higher ground though, another example saw us creating a yarn bridge by tying off at each side. This same bridge might also act as a bouncing platform too, offering another way to reach higher places. In fact, a lot of your progression will come down to taking advantage of the world around you whether it’s pushing a large piece of wood about to be used as a platform or attaching your yarn to a hooking point. Those after something that will truly challenge them may leave disappointed. Through our entire playthrough, the game rarely left us too baffled as to what we were required to do in order to advance. If anything the puzzles are more of a passing distraction than they are a head-scratching brainteaser. Not necessarily a bad thing since we still found them to be enjoyable, but probably not enough for those looking for something more to sink their hungry conundrum-solving teeth into. Story-wise things are kept light and breezy, the opening seeing the game’s main character (Yarny) being swept away at sea by a nasty storm. Washed ashore you’ll then meet a second Yarny character who joins you as you explore your new surroundings. Games built around the idea of co-operative play with each player controlling their own character can often suffer when trying to translate that same experience to a single player. Juggling between two or sometimes more characters (The Legend of Zelda: Tri Force Heroes for example) can often result in a game that feels awkward and more arduous to perform tasks not to mention less entertaining since you’re extracting the human interacting side of things. Something as simple as standing on two switches at the same time becomes a longer and less enjoyable task. While Unravel Two is certainly playable on your own, you’ll find the best experience is obviously had with a partner in tow. To its credit though you can have one Yarny carry the other through areas where two separate Yarny’s aren’t needed. The visuals of Unravel Two are certainly one of its strongest points, the game having an almost photo-realistic look to it. Stages might take you to some fairly unremarkable and every-day locations such as a kids playground, construction yard or deep into the woods, but it’s the dense level of detail in these worlds and the often times moody atmosphere that truly elevates them to something far more interesting and striking. Of course, the Yarny duo are charming as all hell too. Making the transition over from the other more powerful consoles is not without sacrifices with textures a little rough in some areas but, overall, this is still a great looking platformer. Unravel Two is a short but sweet little adventure that makes interesting use of its two yarn-crafted characters. While playing the game alone is still an enjoyable option, its focus on light puzzling is definitely more fun when tackled with another player. A visually impressive and charming treat.